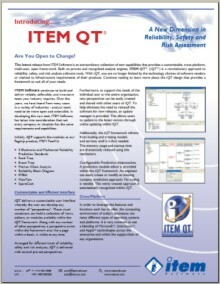 ITEM Software is an acknowledged world leader in the supply of Reliability Engineering Software. If your business is involved with Reliability, Availability, Maintainability and Safety (RAMS) evaluation, or Risk Assessment, you need to contact ITEM Software. Continuously striving to push the boundaries of design, technology and customer care. In 1984 a contract was awarded from the UK Ministry of Defence (MOD) to develop a software program to record and manage a library of electronic components and equipment. In January 1985, the software program "MilLib" was delivered satisfactorily to the MOD and further contracts were awarded. These included a major contract to develop a software program to predict the reliability of electronic components based on the military handbook MIL-HDBK-217, published by the US Department of Defense (DOD). The software program "MilStress" was released in 1986 with huge success and was thereafter available "off the shelf" to any company that required to perform a reliability analysis based on the MIL-HDBK-217 standard. MilStress is still in use worldwide across a number of industries, due in part to its accuracy, reliability and ease of use. The MilStress program has since gone through many phases and in its current form, ITEM ToolKit's MIL-HDBK-217 module , is still recognised as the best available on the market. Since the success of MilStress, ITEM Software has come a long way in providing the RAMS engineers of today with powerful "state-of-the-art" Reliability and Safety Analysis Software Tools. We currently have over 7,500 licensed installations in 37 countries worldwide, including a number of Premier Companies and major organizations in industries such as Defence, Telecommunications, Aerospace, Nuclear, Petroleum, Medical, Electronics, Insurance etc. We continue to maintain our status as the "World Leaders in Reliability and Safety Analysis Software" by providing the latest in software technology fused with 30 years of experience in reliability and safety engineering, together with the excellent after sales service and support to which our customers have become accustomed. Please feel free to browse through our website, register your details and download our latest software products for your evaluation. 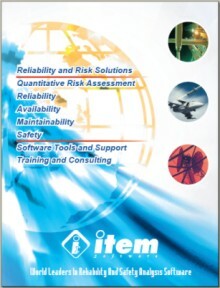 ITEM Software produces reliability analysis tools which are applicable to a wide range of industries. ITEM ToolKit's Fault Tree, Markov, and FMEA modules can be used to model software reliability, physical security, as well as human interaction with systems. 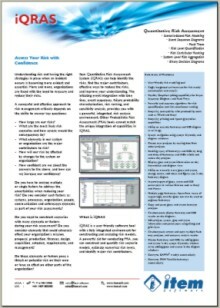 Our Event Tree module can be used to perform Decision Tree Analysis, as well as Safety Assessment of any system. Our reliability prediction analysis modules are up-to-date yet flexible enough to suit your evolving needs. Still have questions? Give us a call, or email us. Thank you for visiting our website at this time. We look forward to being of service to you or your company in the near future. To download free demonstrations of ITEM Software products click here.